Lots has been happening here, leading to a dearth of entries in this blog – not that I think many people actually notice, but still. Aside from my regular day job teaching here in Tokyo, summer has suddenly kicked in, and we’re currently riding the tail-end of a typhoon. Cocoa’s had a busy month with ballet performances, but summer holidays on round the corner. 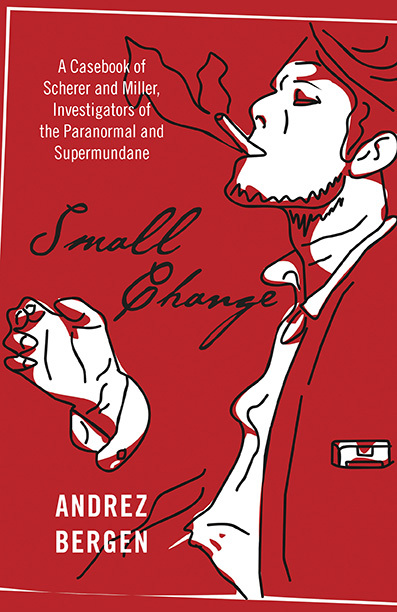 Novel-wise I’m still awaiting the laid-out manuscript and final cover art for the Roy & Suzie book Small Change, which should be published later this year. At IF? 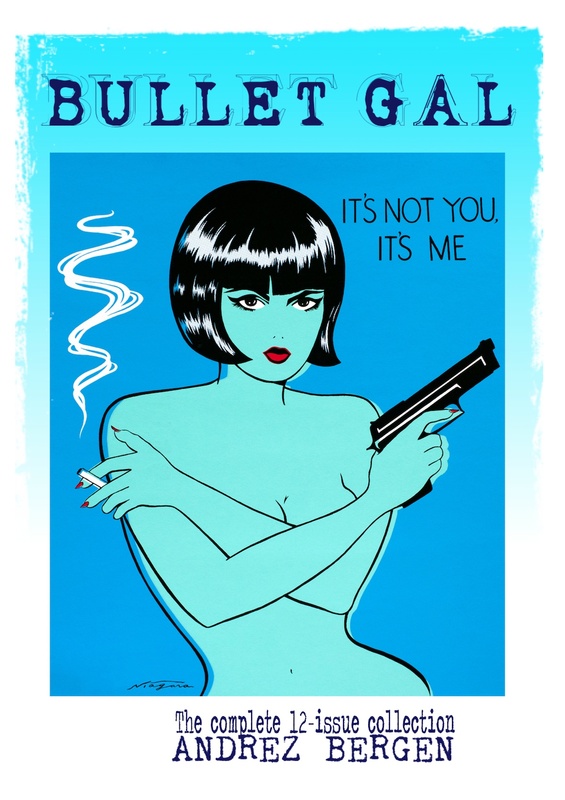 Commix we wrap the Bullet Gal run after twelve issues on the trot at the beginning of August; we’ve already scored some very cool reviews for that issue from the Australian Comics Journal, We the Nerdy, Graphic Policy, All-Comic, Sci-Fi Jubilee and Fanboy Comics. Trista & Holt is also full steam ahead, with #8 (a double-issue) being published in September. That one’s written by über-talented American scribe Renee Pickup, with my on hack art chores. 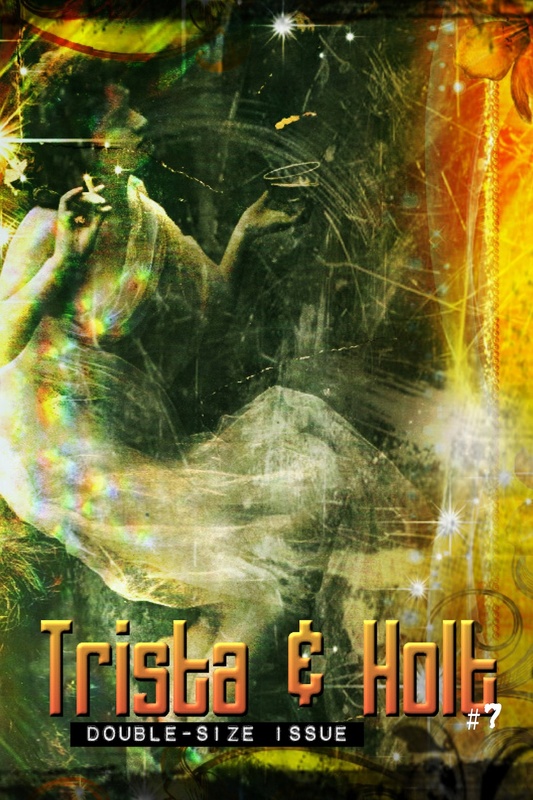 We’ve finished compiling #1-5 of the series as the Trista & Holt Vol. 1 trade paperback, which is currently being printed up as a limited edition in Melbourne and will be released in late August (see below). Trista & Holt #6 is out there now, with some bloody lovely critiques coming from All-Comic, Graphic Policy and Fanboy Comics. 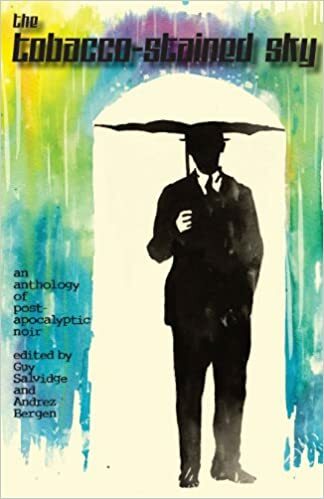 I also just had a lengthy chat with the super-cool and noir-knowledgeable Nevada McPherson over at Graphic Policy, and it was one of the best interviews I’ve had the opportunity to do in ages. Ta, mates! Nevada then further emailed me directly with this to say: “I read all of Trista & Holt Vol. 1 and then #7 and was completely BLOWN AWAY—It was great to catch up with the first two issues and then re-read the rest and THEN get to read #7. 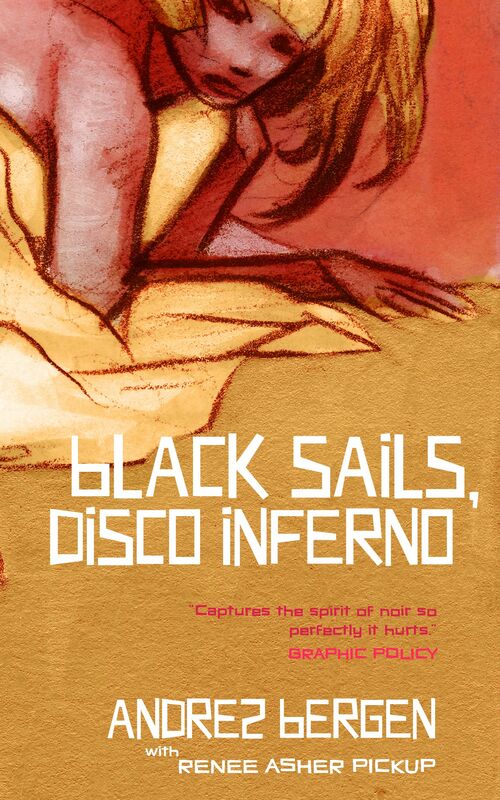 Renee did a GREAT job on the writing and you with the art and I was quite speechless at the end. I’m still rather speechless now… I’ll be reviewing these when I can gather my wits about me. Ahem. Yep, I’m heading home for just over two weeks in August for a rash of DJ gigs, a record label’s two-decade anniversary, catching up with mates and La Familia, and doing a comic book launch. On Saturday, August 15, I’ll be DJing with an old mate and far better disc-spinner Sebastian Bayne, who runs IF? Records, in Sydney for Something Else at The Burdekin. 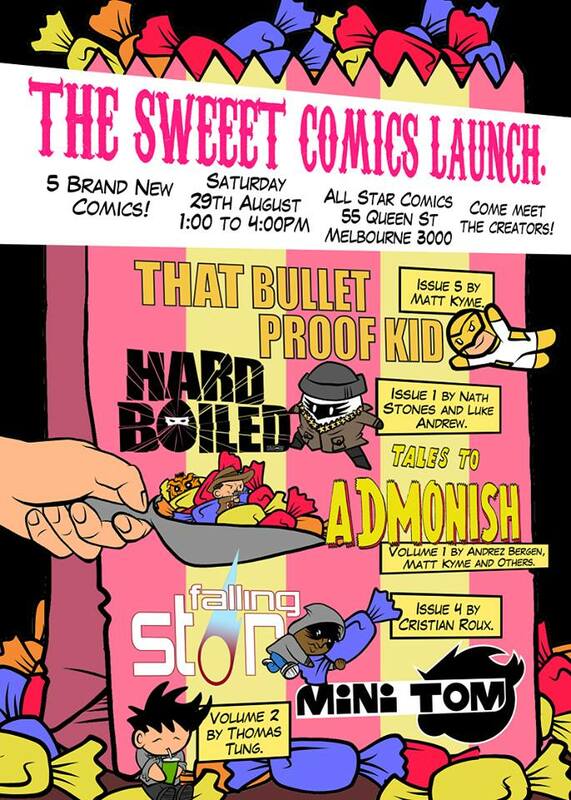 On Saturday, August 29, at Eisner Award winning store All Star Comics in Melbourne, we’ll be doing a comic book launch in the early afternoon. Matt and I decided to put together the first three issues of Tales to Admonish, along with six new stories I wrote by other artists, as a trade paperback we’ll be launching. The added stories are by a swag of talented new artists like Gareth Colliton, Asela De Silva (see excerpt here), Adam Rose and Ken Best. 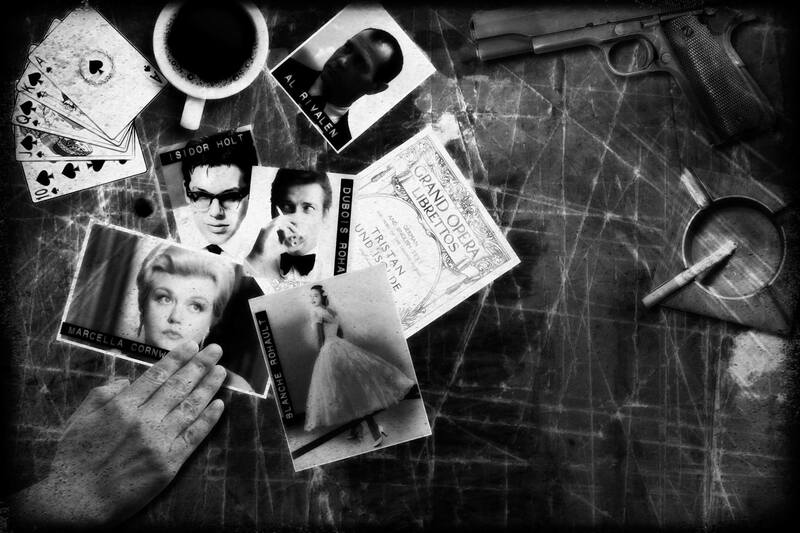 They really capture the vibe of each tale, from noir to light horror. Here’s a sneak preview (shhh!) of the poster designed for that event by local artist Thomas Tung – who’s also launching his next book on the day. Not mentioned is the Trista & Holt Vol. 1 collection, comprising issues one through five, since we’re printing up that limited run only. Most focus is understandably on the Tales to Admonish trade and the other titles (Hard Boiled #1, Falling Star Vol. 2, Mini Tom Vol. 2, and That Bulletproof Kid), but anyone interested can pick up T&H early for just $10 for the 116-page tome. That evening (again Aug. 29) I’ll be throwing on my Little Nobody DJ boater for the final time in the first of two parties celebrating IF? Records’ 20th anniversary. So damned hard to believe that Brian Huber, Mateusz Sikora and I set this thing up in 1995, thus triggering the whole “IF?” thing. The highlight for me, though, will not only be playing at Machine (at My Aeon) – a monthly event I highly respect, run by a talented crew I love whom I’ve also known forever – but getting to kick back and enjoy a live set by local artist Voiteck. I’ve known Voit since 1995 and his sets always slay me. The guy is a local legend and it’s a fitting way to end the trip before flying back to Tokyo the following day.